Last night Jane, Sara, Stuart and I went to see Ma Rainey's Black Bottom at the Lyttelton Theatre on London's glitzy South Bank. 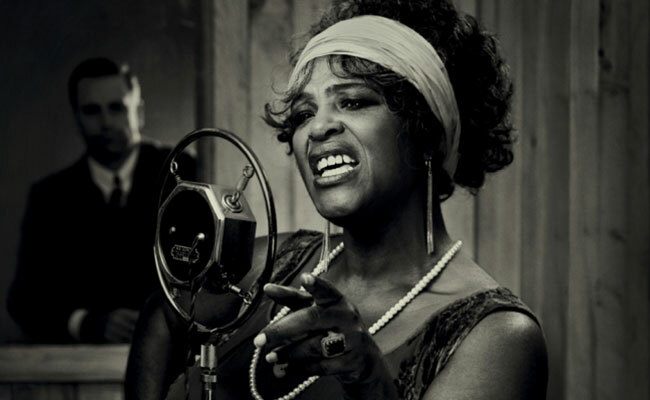 Starring Sharon D Clarke as the real-life Blues legend Ma Rainey the story tells of a day a recording studio in Chicago, 1927. A power struggle is going on between Ma Rainey and her record producers for control of her music. Hardened by years of ill-treatment and bad deals, she's determined that "Black Bottom", the song that bears her name, is recorded her way. Sparks fly. Down below in the claustrophobic band room four black musicians rehearse and tell stories of the terrible racism they have all experienced. Levee, that band's swaggering trumpet player, plans to catapult the band into the jazz age with his new arrangements but his ambitions put them all in danger. The play is powerful, funny, musical and very moving. Maybe not as good as say The Amen Corner or The Colour Purple, both of which this play shares many themes, but still recommended.